'Prevents signs of ageing'... a claim which really draws me in when it comes to skincare promises, I am a believer that preventing is so much better than curing, so when it comes to taking care of my skin and avoiding wrinkles I don't think that anytime is too soon to begin the process. Although I have sensitive skin, I find that my skin benefits from me changing my skincare products every now and again... I tend to stick to the brands I know and rotate products for certain times of the year and my personal skincare needs. This time of year my skin really needs moisture and extra TLC to battle the cold elements and when I was asked to trial some products from The Body Shop 'Drops Of Youth' range, I really couldn't wait to give them a whirl and share my thoughts with you all. 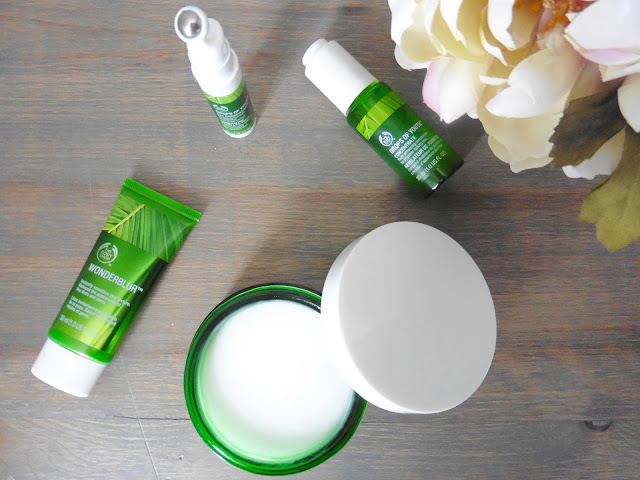 Already as a lover of plenty of Body Shop products, I knew my skin wouldn't react and from the get-go I had high hopes for the range. 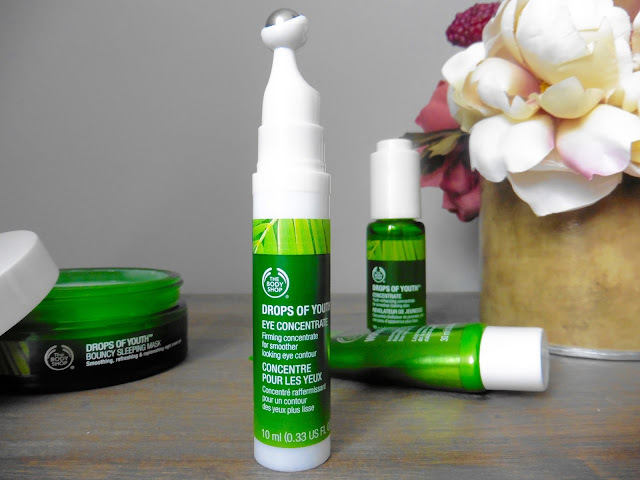 Drops Of Youth Concentrate - I have used serums and concentrated oils on my skin in the past, but they are admittedly not a part of my every day skincare routine, however such a simple step and quick to use product is really easy to fit in and the benefits will be completely worth it. Described as a 'youth-enhancing concentrate for smoother looking skin' which improves skin's firmness, and leaves skin looking more even and fresher. While trailing this, I would simply massage a few drops into my skin before applying my moisturiser on a morning and on a night and for my skin which at this time of year is very dry, it felt like a real treat. My skin soaks this up despite it's gel like consistency and for me the more even and fresher claims definitely get the boxes ticked on a visible level and just for the fact that I can feel improvement myself, it's really enjoyable and relaxing to apply. As with all Body Shop products this contains natural ingredients including plant stem cells and organic Community Fair Trade babassu oil. Drops Of Youth Bouncy Sleeping Mask - This is the product from the range which I had already heard a lot about through other blogs... a 'bouncy' sleeping mask really does sound intriguing and was definitely the one from the range I was really excited about trying. Throughout the Winter months when my skin is at it's driest, I like to use thicker night creams or moisturisers on my skin to give it that extra protection and I've even been known to leave face masks on for an extra ten minutes just so that I know I'm getting everything I can from them, but never before had I used an overnight face mask. The mask is enriched with cell-renewing Edelweiss Plant stem cells which contain vitamin C and antioxidants and promises to leave the skin feeling bouncier, smoother, refreshed, recharged and renewed. The mask itself is a bit of a strange one... it is actually very bouncy to touch and kind of reminds me of that slime stuff you used to buy as a child (hopefully you know what I mean!) but with the help of the little spatula and a bit of massaging into the face and neck it soon disappears into the skin as it starts to soften with a cooling sensation and really natural, fresh smell to it. After use, the next morning my skin always feels light, clean and nourished, it definitely does what it says on the pot. 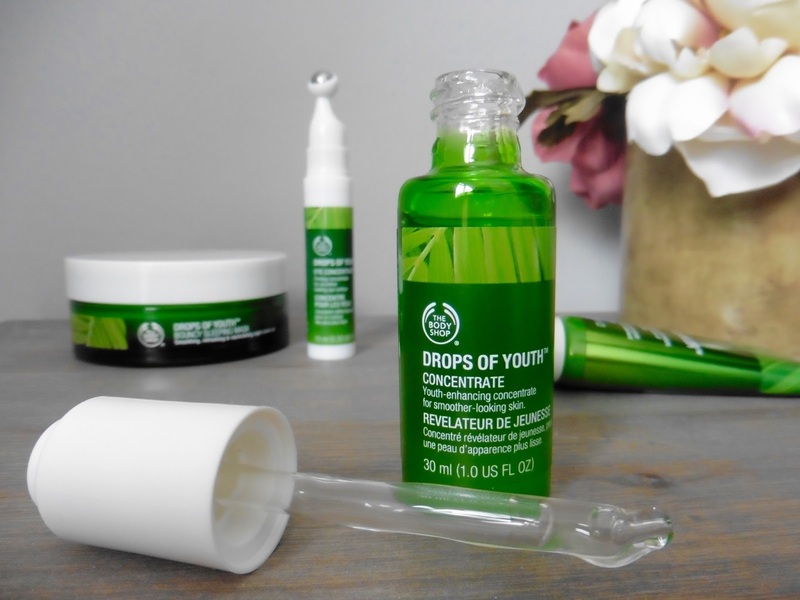 Drops Of Youth Eye Concentrate - Another concentrate from the range but purely for use around the eyes, which for me is a bonus as I have such delicate, sensitive skin around my eyes, I do worry about using new products on this area. The design of this product is great, a quick pump and the product appears around the rollerball and you're ready to roll... It's another thick gel like product, but again a little goes a long way and it sinks into the skin almost immediately. The rollerball instantly cools the eye area and is really heavenly to use, especially as a quick refresh and wake up during my morning routine. It is suggested that the product is applied in a figure eight shape, under and over the eyes (which is new to me, I have only ever used eye products under the eyes before to prevent bags etc) which helps to ensure that all areas which need it most are adhered to. I have found that not only does this feel amazing, it's light and gentle on the skin and my eyes are less puffy... I'm actually a little bit addicted to this product! Wonderblur - Marketed as a skincare product, Wonderblur actually reminds me more of a makeup primer in it's consistency, the feel of the skin after application and the promises it makes for the skin... however, this is better than just a primer as it has skincare benefits and ingredients built into it which similar products do not. Like the rest of the Drops Of Youth range, this also contains Edelweiss extract and babassu oil which help to reduce the appearance of fine lines and pores, even and mattify skin and moisturise the skin for up to 12 hours, all while being really lightweight and breathable. It's very, very similar to Benefit's Porefessional in every way except it doesn't feel heavy on the skin and has plenty of added extras. For no makeup days, this improves the appearance of my skin so quickly and easily, and under my makeup it really helps with keeping things as they should be with a smooth and even base. After using these products for almost three weeks now, I really feel that they suit my skin and that they are truly keeping my skin moisturised and feeling refreshed. I especially love the Eye Concentrate and the Wonderblur, but I would really recommend all four products, they're definitely worth a try for a more affordable anti ageing range and they're cruelty free! Great review! I am surprised I never heard of this, I will definitely have to check this out.